The Norman chancel arch in St Peter’s church in Petersfield is one of the most magnificent in Hampshire, its proportions seeming to signal the architects desire to elevate this chapel in a field to something more. It is possible that the design was influenced by the architecture of Winchester Cathedral. Bishop Walkelyn may well have had a hand in its plans, the three arched windows above the chancel arch have a splendid richness about them. The carving on the chancel arch itself is crisp and clear. The early 12th work is the outer curve which has a large roll, a double line of zigzag pattern, deeply cut and an alternate stepped half round profile. The inner curve is restored work with a plain edge roll. 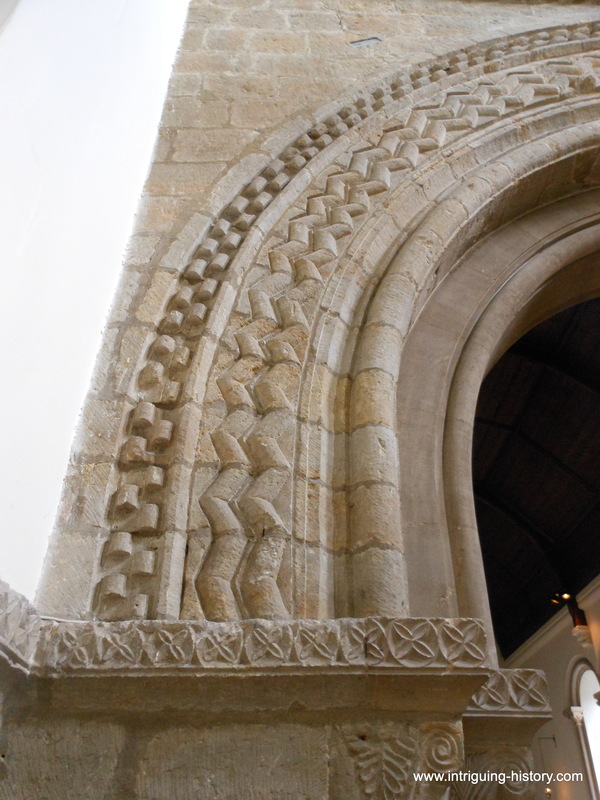 Cast your eyes down to the foot of the capitals and note the old rope pattern, this was supposed to recall the fishing lines of St Peter, the fisherman and is typical of masonry work in other Norman churches dedicated to St Peter.